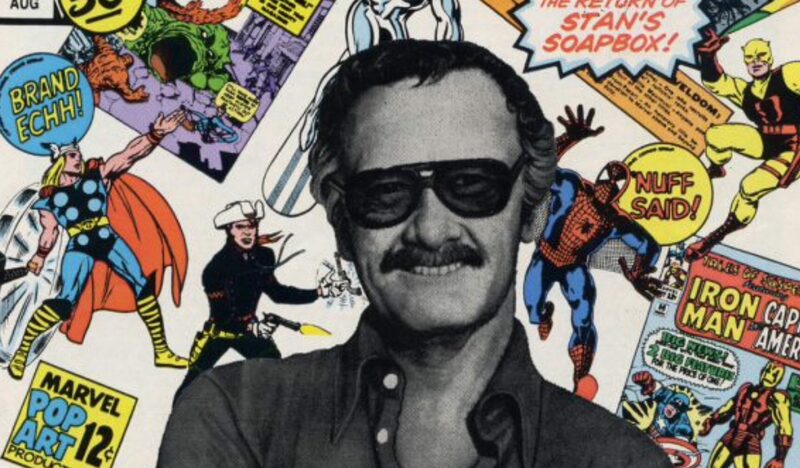 Stan Lee, a brilliant creative genius whose heart and soul put into comic writing, editing, publishing ignited a new generation of comic books, inspiring beyond with no limits. His Marvel Comics brand became an essential modern myth to our culture, expanding beyond the printed page into every other medium possible. Though he passed away recently at age 95 after living a full and awesome life, his inspirations shall continue to awaken our inner superheroes. Yet, there is something more to his work, in the ongoing limited series run that is my life. That is my connection to Stan the Man through the pages with his spirited philosophy on awakening the incredible, the uncanny, the fantastic to my yearning for some amazing fantasy. Such would inspire me to better create, adventure, embrace my geekish side, leading me to maintain my love for comic books for the decades ahead. And with all that, build a sense of duty toward helping many in need, especially when great power and privilege comes my way. My first true exposure to Stan Lee’s Marvel Comics brand came at a turbulent time for me during age 9. I was in the middle of a difficult transition, moving to the big city of San Francisco from the suburban/rural life of Fresno, California. In that, I would also be reunited with my mother after separation for most of my early childhood, and with a new stepdad I would hardly know at the time. I had already begun to miss my old friends and felt a bit overwhelmed by my new loud, confusing big city life. Still feeling on page 1 of this new adventure, I would eventually visit my first comic book store, where my life would forever change. It was a small little store in the North Beach (aka Little Italy) area on Grant Street near the Coit Tower landmark. I think the store name was “Best Comics” or something like that (not the nearby more famous, Comix and Comix, which I would discover later and spend many after school hours in). Within, I walked into the next giant splash page of my life, rich in detail and dramatics. Rows of comics books around me, with boxes of more below. Some stacks were stray, and come loose on counters. There and everywhere inside, were some familiar friends from TV and toys. All with much more vivid color and detail, speaking in word balloons, in combat poses, expressing action. I saw the Amazing Spider-man, as known from my beat-up stuffed plush doll. I would see the X-Men, recognized from some comics in a waiting room at the last eye doctor visit. I saw the Iron Man, Thing, Captain America recognized..and more from a Marvel Super Heroes card game played often in the library of my early grade recess hours. So many familiar faces in colorful outfits; waiting for me to get to know them; take an adventure with any back home. But, I had a little money to pick something. After some browsing, I gravitated to a spinning rack of paperback digest-sized comics. Such was not common for the comic book-sized format, but I wanted something with more pages, and easy to carry around. And eventually, I saw this small paperback book… Stan Lee presents The Incredible Hulk (#2). It was a 159-pages of full color, 1979 reprint stories of the older Tales to Astonish (mid-1960s, #85-99) stories of the continuous adventures of Bruce Banner, a scientist who would become the Hulk under very stressful circumstances. I knew the green goliath from TV live-action series, starring Lou Ferrigno. But here, he was different and greener with stories far beyond anything the TV show would offer, with more expression, more action, more Hulk! I would buy this with some pocket change, and then witness the pain and the power, the man-brute at his best! Inside, the Hulk would prove himself as the strongest, against the US military, super-villains, aliens, the High Evolutionary, the Abomination, the Silver Surfer. Each chapter seemingly more excited than the last. Between the action, we got interesting internal struggles, especially within the Hulk and his other self, Bruce Banner. Both would conflict against each other as much as the outside world. This drama is as exciting as the action itself was all written by Stan Lee himself, a name I would never forget. Stan Lee, through passionate exposition and character building, would give me a message that would stick far beyond the printed pages. Inside, we have trapped within, some incredible greatness waiting to be released through some incredible circumstances. The greatness can be so outstanding and wonderful, that we struggle to recognize it when it’s upon our weaker selves. But in reaching that, we don’t want to look back, until the power becomes a troublesome burden. Then, yearns a return to innocence and normalcy until we need that power for greater responsibility. That’s what I got out of this Hulk anyway. 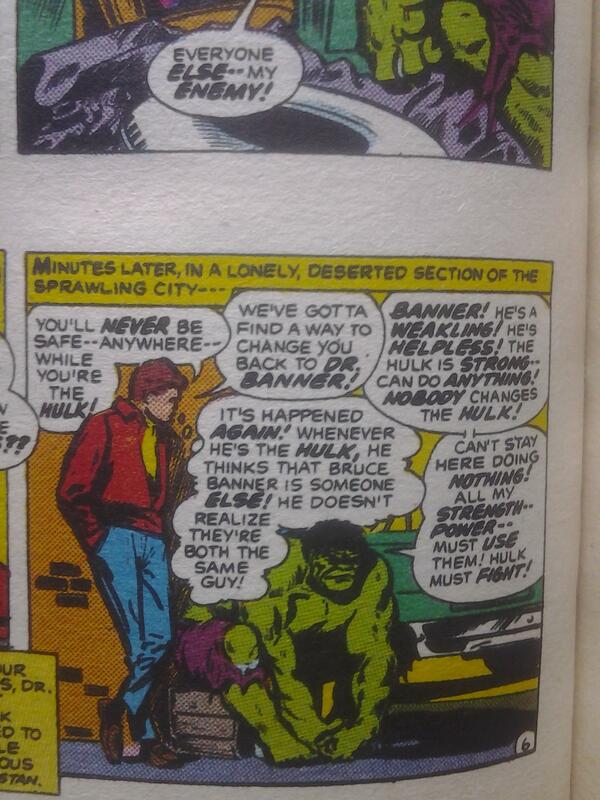 The difference in the Hulk from other super-types is that his heroism is more on a subconscious level. The Hulk would often find himself protecting the weak while crushing those stupid enough to try to exploit him. He is selfless, never looking to harm others. He would prefer to be left alone, and in that when there is no reason to fight, there is peace for the Hulk and Bruce Banner. All that, presented by Stan Lee. A name I would first notice more in my next few rereadings of that awesome paperback. His name would return again and again, in many more Marvel Comics I mostly gathered from cheap quarter bins, flea market finds, more bookstores. The later eighties and early nineties, I spent many hours growing up in the comic stores after school. There, always peeking into the comics of Marvel, and eventually other companies (DC, Gladstone, Mirage, Archie being my top favs). But often coming back to Marvel, there would be new favorite stories from Stan Lee’s design stemming his creative work, and groundwork messages. The X-Men, heroes living a parallel of the fear and prejudice in today’s world. Spider-Man, a hero whose personal issues would be set aside to defend New York City. Daredevil, a hero for justice whose blindness is both his greatest curse and strength. The Fantastic Four, a family whose cosmic radiated superpowers would lead them into deeper explorations of the unknown. And, many more would follow. 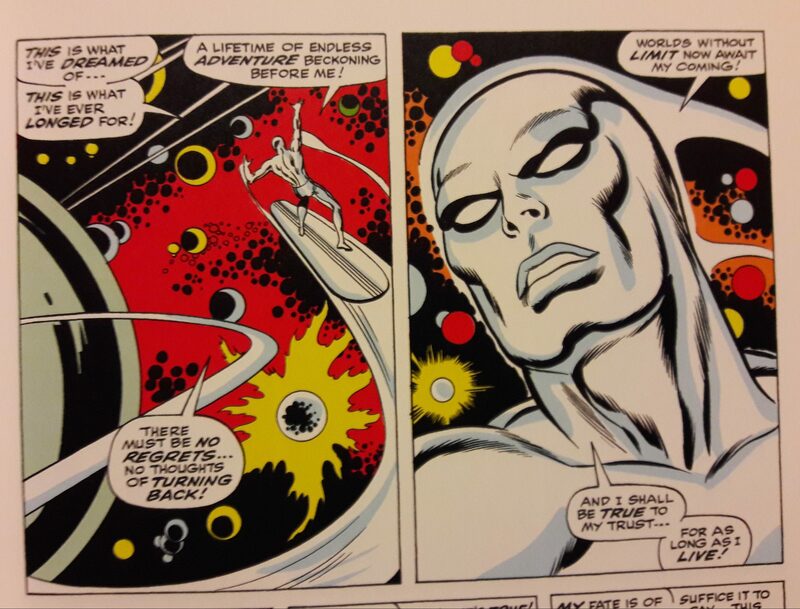 Among them, my personal favorite, the Silver Surfer, after finding reprints of the earlier stories written by Stan Lee (#1-18, 1968-1970). This above all is Stan’s most philosophical, poetic storytelling of all. Every page full of Stan Lee’s presentation, dialogue, exposition of the lonely cosmic traveler in a constant struggle to understand the worlds around him, is awesome. Over the years, the spirit of Stan Lee would carry on through countless cherished comic stories. Then beyond the cartoons and TV shows. Sometimes, Stan Lee would do some introductions or narration; bringing his passion for storytelling along. Eventually, would come to the movies, which he would have some hand in producing. And, there would be the cameos…always welcome to his fans. And his presence would be felt at many conventions, often in person. I would attend a few of his panels, looking back to his past of promoting some collaboration on projects. I would even meet him, once by pure luck, while resting nearby his booth in the early 2000s at the San Diego Comic Con. He signed a Spider-Man collected stories paperback I happened to have in hand, and then we shook hands. “Excelsior!,” Stan Lee said with a blessing. That cherished memory, I would look back upon as the greatest echo of my comic book relationship with Stan, since seeing his name for the first time many years ago. I still feel his work throughout my life, and sometimes it helps keeps the best parts of me going. I sometimes need the attitude of the Hulk on a bad day, the curiosity of the Silver Surfer in my travels, the energy of Spider-Man in keeping up with responsibilities, the leadership of Professor X for group organizing, the patriotic duty of Captain America when I join a protest. Stan Lee’s work continues to inspire me through the foundations of the fictional heroes he shared. And much like the Marvel Comics that continue on through the comic stores and extended media, there never really is an end to it all. We carry on through reboots, cliffhangers, spinoffs. Though sometimes, we may not get some things right in interpretation. And sometimes, there is are rediscovering of his lesser-known creations through better presentations, like the recent Black Panther and Ant-Man movies. meanwhile, the presence of Stan Lee will carry on, reminding many of us of his original groundwork laid down for readers to grow from. Thanks again Stan the Man, and Excelsior!